Aberdeen face Rangers in the Quarter-Final of the Scottish Cup this Sunday with the winner booking a last four date Hampden in April. There’s been hardly anything between the sides this season although The Dons do have the better record going into the match, but it’s a new match come Sunday as they aim to get back to the national stadium next month. Ahead of the mouth-watering tie Derek McInnes and Michael Devlin spoke with the media on Friday morning. “We’ve been in one cup final already and we’ve always said the cup competitions offer us the best chance to try and bring a trophy. We’re one of a few teams left who could win the trophy and that’s what we believe in. “We’ve went into games against Rangers this season with them in good form. They’re a good side there’s no denying that and there’s been huge improvements in Rangers. They’ve got a huge and fantastic squad of players, but on the day you can only play eleven and we feel our eleven that’s selected are capable of doing a job. We’re waiting on a few to see if they can make it and we’ll give them every chance to make the game on Sunday. “We take the positives from our meetings with Rangers this season. Obviously we lost the most recent meeting, but on that day we performed well and were unlucky not to get something for the game. On that our record this season’s been good so we’ll call up on those experiences to give us confidence going into Sunday. “There’s no better occasion round the corner after the disappointment of Wednesday with Rangers at home. We’ve gave our fans something to cheer about against Rangers this season with the game at Ibrox, the Semi-Final and the last minute equaliser with young Bruce at the start of the season. We can hopefully replicate that on Sunday and get a real feel good factor at the club again. Sunday marks the fifth time Derek McInnes and Steven Gerrard have met this season and The Dons have been able to overcome their counterparts on two occasions. The former Liverpool captain’s first domestic match brought him to Pittodrie and his side were undone by youngster Bruce Anderson popped up in injury time to score a dramatic equaliser. Rangers played most of the match with ten men following Alfredo Morelos’s kick out at Scott McKenna. 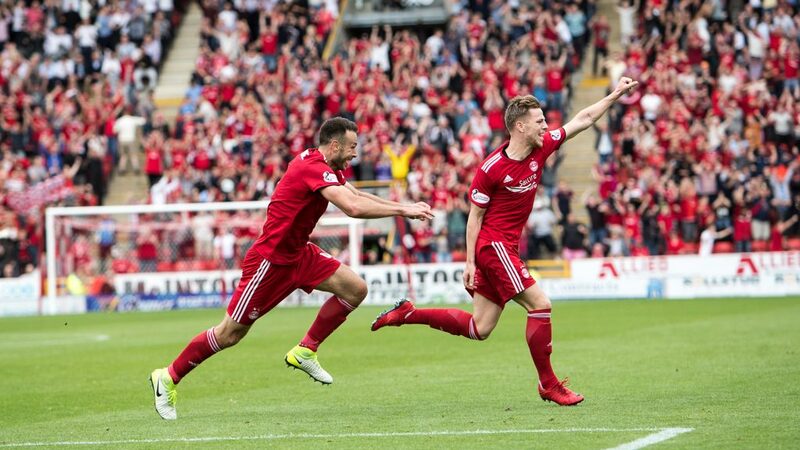 James Tavernier converted a spot kick to give the visitors the lead, but Anderson grabbed the headlines with a well-executed finish to give Aberdeen a point on his debut. Hampden was the next place of meeting for the teams in October as the Betfred Cup Semi-Finals moved to centre stage. at the end of October. 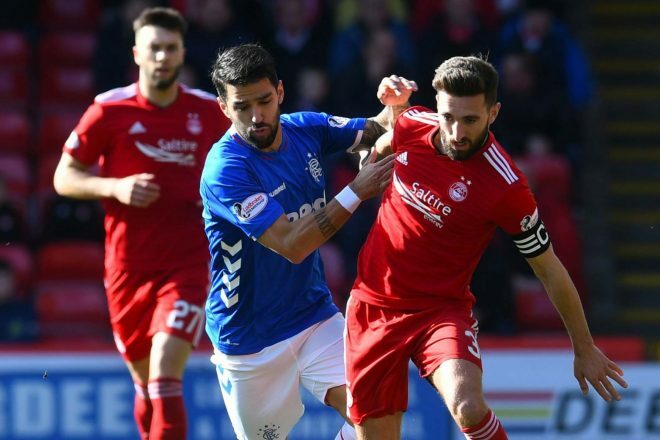 Although Rangers had much of the possession they were unable to really trouble Aberdeen and as the clock ticked down one goal was always going to settle it. Thankfully the goal game from the head of Lewis Ferguson with ten minutes remaining, which sent the Red Army behind the goal into a frenzy. The men in red were able to stay calm to reach the first final of the season. 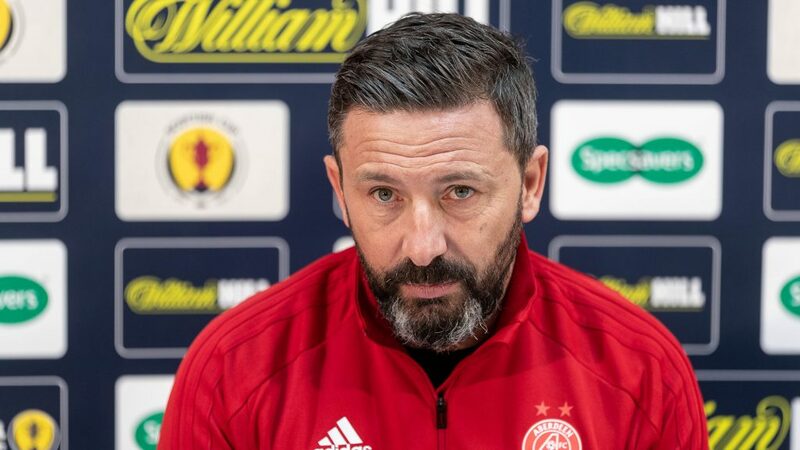 It took Aberdeen 26 years to win at Ibrox, but Derek McInnes has been able to find the points on two occasions since coming into the job at Aberdeen. Back in December he achieved the feet for the second time thanks to an early Scott McKenna volley from 10 yards out. As is custom with this fixture there were plenty of talking points and both sides saw red. Sam Cosgrove was given a second booking for catching Connor Goldson in the corner and Alfredo Morelos caught Graeme Shinnie with a flailing arm and the referee evened up the teams. It was another excellent performance from the visitors and in truth were comfortably able to see out the match. That win started a winning run on the road that they are still on, recently equalling a club record of seven at St Johnstone. The most recent clash saw both sides again ending the game with ten men. Rangers took an early lead thanks to Morelos, but Sam Cosgrove was able to equalise by capitalising on a rebound inside the area. Morelos was then able to find the bottom corner to regain the lead for Rangers and it was three when Scott McKenna handled in the area and Tavernier slotted home the spot kick. The second half demanded a reaction from the hosts and it got it inside the opening minute of the half when Ferguson was bundled over by Tavernier inside the box. Cosgrove made no mistake from 12 yards and gave The Dons the lift they needed. Then more flash points. Morelos and McKenna clashed in the corner and the Columbian took another swipe at the Aberdeen defender, which he reacted too and Morelos ended up on the floor. Bobby Madden was straight over with the red card for McKenna, but there was a waiting game for Morelos to get up and he was awarded a third red of the season in the fixture. The Dons pushed hard for the equaliser, played some good football and created chances but were unable to find a way through and with Aberdeen pressing up the park, Rangers countered and Jermain Defoe finished the match off with minutes remaining. Sunday marks Pittodrie’s 39th Scottish Cup Quarter-Final and it’s a competition that’s steeped in the club’s history with seven trophy lifts. 29 years have passed since Brian Irvine stepped up and scored the winning penalty against Celtic in the shootout and The Dons will be looking for a chance to get back to the national stadium in May once again. 1958-59 Saturday 14-Mar-59 Kilmarnock QF 19000 W 3 1 Mowat, J.A. 1972-73 Wednesday 21-Mar-73 Celtic QFR 33465 L 0 1 Davidson, R.H.
1974-75 Saturday 08-Mar-75 Motherwell QF 23400 L 0 1 Foote, I.M.D. 1977-78 Saturday 11-Mar-78 Morton QF 17394 D 2 2 Gordon, J.R.P. 1978-79 Saturday 10-Mar-79 Celtic QF 23000 D 1 1 Foote, I.M.D. 1981-82 Saturday 06-Mar-82 Kilmarnock QF 12000 W 4 2 Valentine, R.B. This will be Aberdeen’s 20th Scottish Cup tie under Derek McInnes with The Dons manager leading his team to eleven victories previously. The first of those wins came back in December 2013 as Andy Considine’s header was the only goal of the Fourth round tie at Firhill against Partick Thistle. Arguably the finest performance came at Celtic Park the following round as they came from behind to knock the holders out on their own patch thanks to goals from Russell Anderson and Peter Pawlett. Unfortunately, they wouldn’t get a crack at the cup double as a Stevie May inspired St Johnstone produced a comeback of their own at Ibrox in the Semis. Fourth round exists to Dundee and Hearts would follow in the next two campaigns, but The Dons did reach their first Scottish Cup Final for 17 years in 2017. 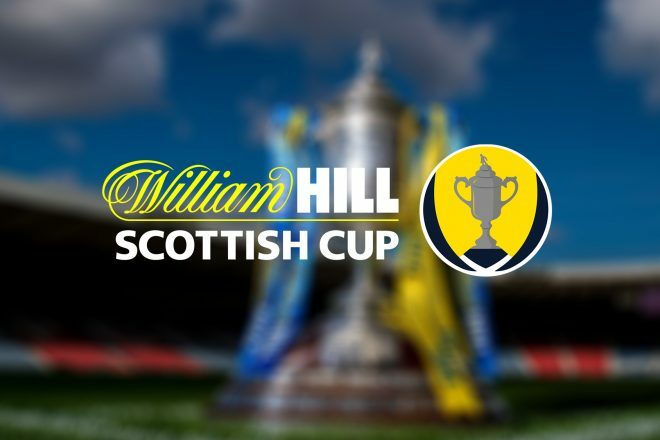 After overcoming Stranraer, Ross County and Partick, they faced holders Hibs at Hampden for a place in the final. The Dons made the most perfect of starts when Adam Rooney nipped in after only 12 seconds to give Aberdeen the lead. It was 2-0 after 25 minutes when Ryan Christie deceived the Hibs wall and goalkeeper to find the front post with a curling free kick. The reds were in control, but Hibs changed it up and substitute Grant Holt had them back in it before the break and Aberdeen were up against it. It had taken them over 100 years to win it and Hibs weren’t willing to give up on their trophy so easily and Dylan McGeough equalised on the hour mark. With the game looking like it would go to extra time Jonny Hayes got a huge slice of luck with a deflected effort from distance. It proved to be the winner and The Dons were heading back to Hampden. If you can’t make the match make sure to tune into our RedTV coverage with former captain Paul Hartley joining Dave and Andrew on commentary duty. UK subscribers can listen live from 1.15pm and those abroad can watch the match in full. Post-match we will have reaction, goals, highlights and a full match replay. The Dons responded to midweek disappointment against Hamilton Accies with a strong performance in this cup tie at Pittodrie but had to settle for a replay as Worrall’s second half goal cancelled out Cosgrove’s opener. The Dons made one change to the side that lost out in midweek with Mackay-Steven replacing McGinn. The home side were also boosted by the news that Max Lowe had shaken off an injury sustained against Hamilton to retain his place in the starting line-up. The opening few minutes of the match presented a battle for midfield supremacy but as the match approached the 10 minute mark the wide players from both sides started to have an impact with Candeias and Stewart asking questions with some enticing crosses. In the 9th minute Lowe won the ball in the middle of the park and drove towards goal before slipping the ball through for Mackay-Steven who was brought down by Goldson. Mackay-Steven picked up a knock from the challenge and had to receive treatment which resulted in a delay for the penalty to be taken. When the time did come to take the penalty, Cosgrove stepped up and slotted the ball to McGregor’s left, the shot had just enough power to find the net despite the keeper’s best efforts. It was a great start for The Dons but almost immediately from the restart the visitors issued a reminder of the threat they posed as Morelos broke down the right, showing great pace before hitting a low shot towards goal which Lewis turned behind. It was an example of the quality that Morelos undoubtedly has but moments later there was an example of the other side to his game as he received a yellow card for a blatant dive in the penalty area. Mackay-Steven had certainly made his mark on the game but was unable to shake off his injury and was replaced by McGinn in the 15th minute. Both keepers enjoyed a quiet spell until McGregor was called upon in the 31st minute. Stewart produced a n excellent delivery from a free-kick and McKenna was there to meet it with a powerful header at the back post which McGregor tipped over the bar. Rangers then had an opportunity to equalise in controversial circumstances when Cosgrove was denied a free-kick on the edge of the area. The visitors burst forward on the counter-attack through Kent but Ball managed to put enough pressure on to force the winger into a shot which ended up well over the bar. Candeias broke in behind the defence on the right with a few minutes of the half remaining but he was unable to produce a final ball for one of his teammates as the cross trundled out of play. The Dons were restricting the visitors to half chances and looked a constant threat on the break with Cosgrove linking up well with Stewart, McLennan and McGinn in support. In added time of the first half another opportunity to counter presented itself when Jack gave the ball away in midfield. Stewart broke forward before playing Lowe in down the right, but the full-back was unable to pick out Stewart or McGinn in the area as the referee brought an end to an entertaining half. All in all, it was a great half for the home side with every player doing their bit. The visitors stared the second half on the front foot as Goldson found Kent at the back post with a long diagonal. The winger headed the ball across the box but it was a let off for Aberdeen as the attack fizzled out. Rangers were gifted a cheap corner in the 48th minute when Stewart was unable to turn the ball back up the field. From the corner Worrall made his way round the back of the defence and volleyed the ball into the net from 6 yards. It was a decent delivery but a very poor goal for The Dons to concede. A few minutes later McLennan looked to burst into the area but went down under a challenge and picked up a yellow card, the winger contested the decision to no avail. The Dons saw an opportunity to get bodies in the box from a throw-in as Considine headed up the park. The move didn’t work out as planned as Rangers cleared the box and broke down the right before Candeias picked out Kent. Kent then laid the ball off for Arfield, who was unable to keep his shot down. On the hour mark the hosts had a corner and were unfortunate not to get back in front. The delivery was whipped in to the near post and Considine got to it first, his header was flicked into the path of McKenna, but Rangers did enough to block his effort. The ball fell for Shinnie 10 yards out, but he was unable to beat the blue shirts on the line. It kicked-off a good spell for Aberdeen, with multiple corner kick’s going their way but they were unable to get anything on target to test McGregor. 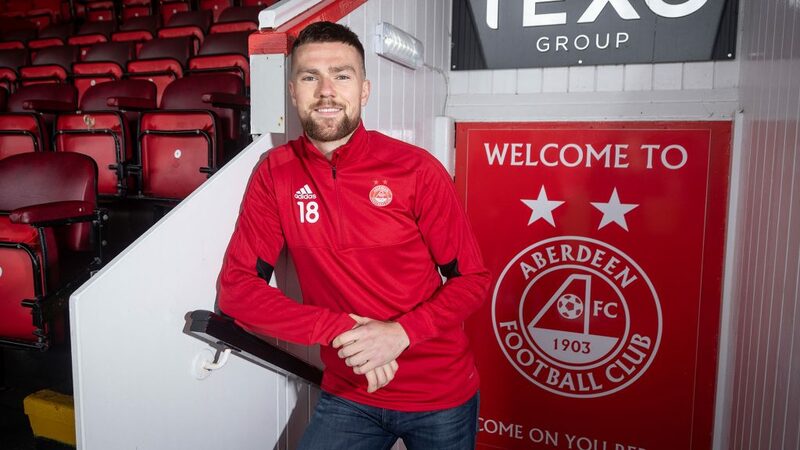 Cosgrove became the second Aberdeen player to receive a booking when he contested a high ball with Barisic and caught the full-back with his arm. Shinnie then followed Cosgrove into the book in the 70th minute after catching Arfield in a 50/50 challenge. From the free-kick McKenna did very well to head the ball clear. In the 75th minute a free-kick delivery produced another goalmouth scramble when Ball hooked the ball back into the area after the initial header was won well, McKenna then had an opportunity to strike at goal but the ball was well blocked once again. Moments later Lowe was booked for a challenge on Tavernier just inside the Rangers half, it looked a very harsh decision. Rangers won a corner with 8 minutes of time remaining which Lewis did well to punch clear. With 5 minutes remaining McLennan was replaced by Wilson as Aberdeen searched for a winner. Morelos had largely been kept quiet by Considine and McKenna but he was presented with a fantastic opportunity in the 88th minute when a corner kick fell his way six yards from goal. Fortunately for Aberdeen, Considine was there to thwart the striker again with a great block. The last ditch challenge ensured that the sides would meet for a replay at Ibrox on Tuesday 12th March.